2016 was the year in which NS put a difficult period behind it and was able to start looking to the future again. We are working towards the mid-term review in 2019 when the authorities will assess our performance. We therefore took measures to improve our performance structurally, we adapted our strategy and we paid a great deal of attention to compliance and integrity. Many of our performance figures improved in 2016 compared to 2015. General satisfaction about travelling by train on the main rail network rose, as did punctuality, assessment of the cleanliness of trains and opinions on journey information. Nevertheless, it did not go well enough on all fronts: performance of the HSL South services remained below what was desired, for instance. Furthermore, we introduced the first new Flirt trains onto the tracks, which will help raise levels of travel comfort and improve the chance of getting a seat, and nearly three quarters of our trains ran on wind energy. Passengers also felt safer in the trains and at the stations. The attention we pay to safety remains undiminished; every incident is one too many. Unfortunately, the number of times our employees reported physical aggression increased. NS encourages staff to report all incidents of aggression. Since the irregularities in Limburg and the Fyra inquiry, we have paid a great deal of attention to integrity and compliance. NS has been reorganising its processes and structures and is encouraging a culture of openness and addressability. There is now an integrity portal that staff can go to with questions about integrity, we have a new screening policy, and measures have been taken to guarantee a level playing field and manage risks better. NS is continuing to acquire experience on the European railway market through Abellio and we are preparing for any further deregulation of the railways. In that regard, we have agreed that we will not take any major risks for new franchises. A piece of good news was winning the Greater Anglia franchise in October 2016. That was however offset by the loss of Northern Rail in April. ScotRail has got a challenging first year under its belt, as a result of which performance remains below target. Abellio won three new tenders in Germany and our train service between Düsseldorf, Bocholt and Emmerich commenced in December. A noteworthy point is that this means Abellio will be operating a cross-border franchise for the first time, from Arnhem to Düsseldorf in April 2017. In financial terms, NS has a reasonable year under its belt, thanks for instance to a positive contribution from foreign activities and oneoff windfalls. Revenues were €5,093 million, which is an increase with respect to 2015 (€4,973 million). The main rail network franchise KPIs for 2019 are also leading factors in the financial policy for the NS business plan: as in 2016 (total investment of €791 million), we continued to invest in programs that help us achieve the KPIs, customer satisfaction, new rolling stock and productivity. Bringing the costs down further in the staff departments and in indirect costs will certainly be a challenge. The mobility that we provide means that NS makes a positive contribution to Dutch society. Our social impact improved in 2016. Reasons include the fact that passengers travelled considerably more by train than in 2015 (over 350 million extra kilometres), which had a positive effect on our impact on mobility and safe travel with respect to the car. The negative environmental impact is the result of using fossil fuels. Because trains were running on 73% wind energy in 2016, that impact was less, yielding a positive effect of €15 million. Measures have also been taken that considerably reduced the negative impact of journey time in crowded trains. To provide safe travel, NS is working with its partners on preventing collisions and derailments or unsafe situations at the stations. There were only three incidents with injuries in 2016, compared with 30 in 2015. Because of a fatal accident involving a railway worker, the social costs of rail travel safety rose by €6 million (€3 million in 2015). In 2017, NS will continue on the course previously set. 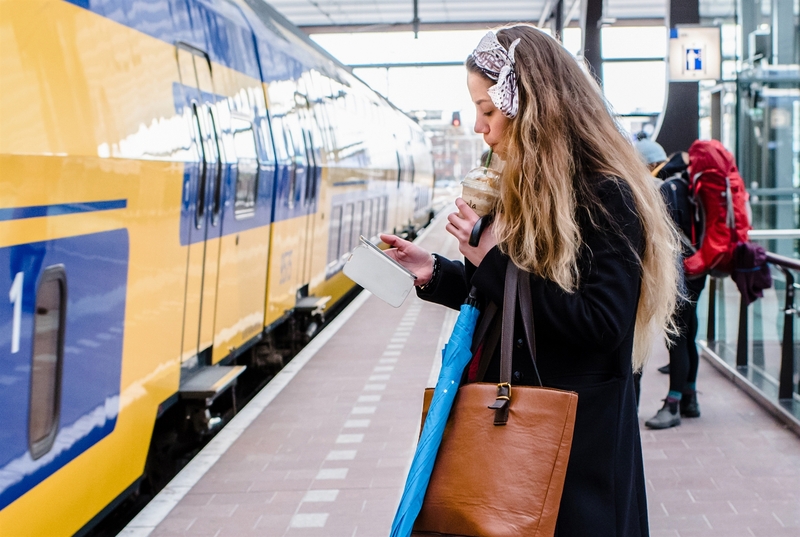 Concentrating on our core activities will let us genuinely focus on the passengers and help fulfil our social role of enhancing sustainable mobility in the Netherlands. Our electric trains in the Netherlands – including the first upgraded VIRM-I class double-decker trains – have been running entirely on green power since 1 January 2017. In terms of services, we are rolling out initiatives for greater ease of payment, such as travelling on account and paying by credit card. We are deploying increasing numbers of new trains, working on improving bicycle storage facilities and we will be opening the refurbished stations at Tilburg and Eindhoven again fully in 2017.